Construction on the new Burke Museum will continue until at least the end of October, now that the University of Washington has provided the state museum with a bridge loan. The University of Washington is coming to the rescue of the state’s natural-history museum, offering the Burke Museum a short-term loan so construction of its new building can keep going even with its state funding in limbo. The loan buys the project three more months of construction time, allowing contractors to finish the exterior and install major building systems. That will create “a more logical stopping point should we need to pause construction in the fall,” said museum Director Julie Stein. Last month, the museum thought it might have to stop construction immediately after the Legislature failed to pass a capital-projects budget for 2017-19. The Democratic-controlled House and GOP-controlled Senate were unable to come to a deal on a rural water-use bill last month, and Senate Republicans stood firm on a pledge not to pass a two-year capital construction budget without first fixing the water-use issue. With the loan — backed by $14 million in private donations that have been pledged over the next three to five years — construction will be able to continue through October. 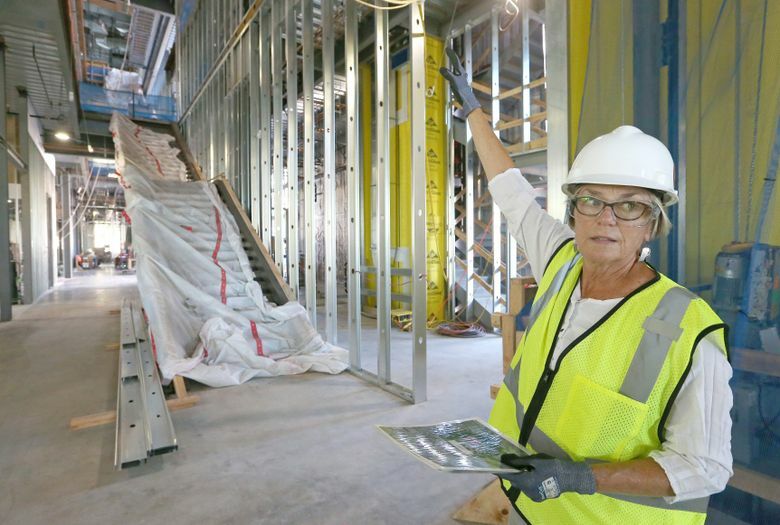 The museum building is about two-thirds complete, and the Burke needs $24 million to finish the project. The state has the money; it’s budgeted in the stalled $4 billion capital improvements bill. The 2018 legislative session is scheduled to begin Jan. 8, and a special session before that date appears unlikely. The existing Burke was constructed on the cheap in the 1960s, and has no central air conditioning or climate controls. It’s a poor environment for the natural-history museum’s many treasures, including priceless Native American art such as baskets, drums and canoes. Although on the UW campus, the Burke is a state-owned museum, run by the university. Last week, Stein, its director, toured the shell of the new museum in hard hat and boots, showing how the new building will help accomplish a major goal: to put more of the behind-the-scenes work of preservation and curation in front of visitors. Bringing the science and curation work to the fore is a trend among museums around the country. In art museums, paintings are sometimes restored while the public watches, and in natural-history museums, paleontologists prep fossils while visitors look on. Stein believes the new Burke will be the first museum in the country to put every aspect of curation front-and-center. “I don’t think any other museum has done this, where they’ve turned the entire museum inside out,” she said. Nearly every space in the three-story building — which will be about 66 percent larger than the existing building — is designed to allow visitors to peek into the museum’s backrooms, to see scientists at work on specimens, and to glimpse the vast holdings of Northwest Native American art. Right now, it takes some imagination to visualize what it will look and feel like. But the museum has set aside a room on the main floor of the existing Burke to give visitors a sense of what the new Burke experience will be like. In that area one day last week, a volunteer worked to preserve the body of a long-tailed vole from Mount St. Helens — carefully removing the animal’s innards and replacing them with sawdust as a first step in creating what the museum calls a “skin.” Eventually, the specimen will be stuffed with cotton. A rolling screen partially obscured the window and warned the squeamish about what was going on. But a group of young children swarmed over to the window anyway. “Hey guys, check this out,” one boy said excitedly. The kids pressed against the glass, issuing various expressions of disgust and fascination. On the other side of the bulletin board, visitors had left behind stickies with their reactions. “Awesome and gross!” one wrote. Elsewhere in the room, mechanical-engineering students were helping museum experts get ready to print a 3-D mammoth skeleton. Fossilized bones from the West Richland mammoth — a 1978 discovery near the city of Richland — will be paired with 3-D printouts of the missing bones. The museum has 40 percent of the Columbian mammoth’s bones, and modern technology will make it whole again. When the new Burke is done, the mammoth will stand in a corner of the third floor of the new museum, overlooking a canopy of trees. “Very Jurassic Park-y,” Stein said. Many Burke fossils are coming from a dig in the Hell Creek Formation of Montana. In that area last year, paleontologists found a nearly complete skull of a 66-million-year-old Tyrannosaurus rex — one of only 15 reasonably complete skulls ever found. That skull will have a starring role in the new museum. The new Burke will be clad in wood siding, to evoke a feeling of being in a Northwest forest. The museum will feature long, thin windows in some locations, and bigger, more expansive windows in other areas. Many of the museum’s treasures are harmed by sunlight, yet visitors often complain that when they’re in a museum they feel disoriented because they can’t see the outside. The plan is to try to solve both those problems with strategically placed windows and skylights, Stein said. The mastodon now on display in the Burke will move to the new museum’s lower lobby, and the lobby will also include a new, articulated skeleton of a Baird’s beaked whale and a new piece of Coast Salish art commissioned by the museum. The building is being constructed by Skanska USA and has about 120 workers on-site. When the T. rex skull was moved to Seattle, Skanska construction workers pitched in to help remove it from the truck. Earlier this year, the children of the construction workers got a behind-the-scenes tour of the Burke. “We’re very fortunate to be here,” said Sam Stevens, the senior project manager for Skanska. Building a museum is a prestigious project, with a lasting footprint on a city’s cultural life. 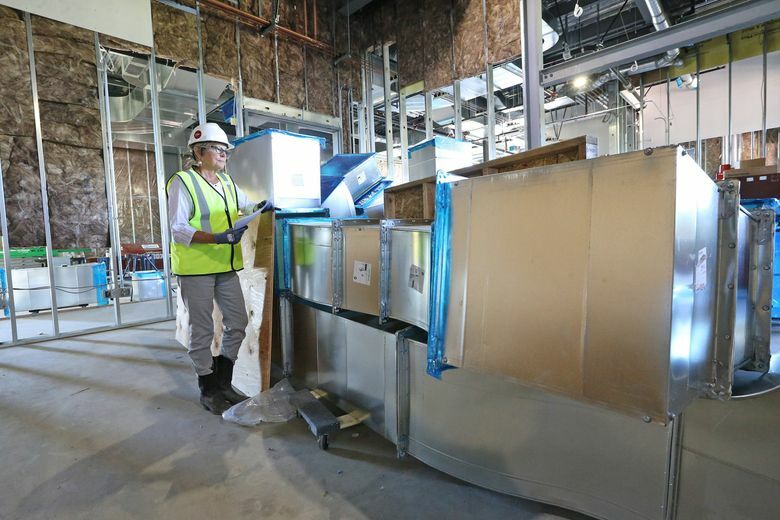 “The team is excited to show off what they’re building,” Stevens said.